We found a dosa shop in Gurgaon that reinvents the humble South Indian dish. Aloo masala is passé – think Nutella, chow mein or Maggi. InstaDozza is located at the DLF Phase III metro station, making it the ideal pit-stop if you’re hungry in transit. We love that it’s not just another South Indian restaurant — InstaDozza gives dosas wacky makeovers. 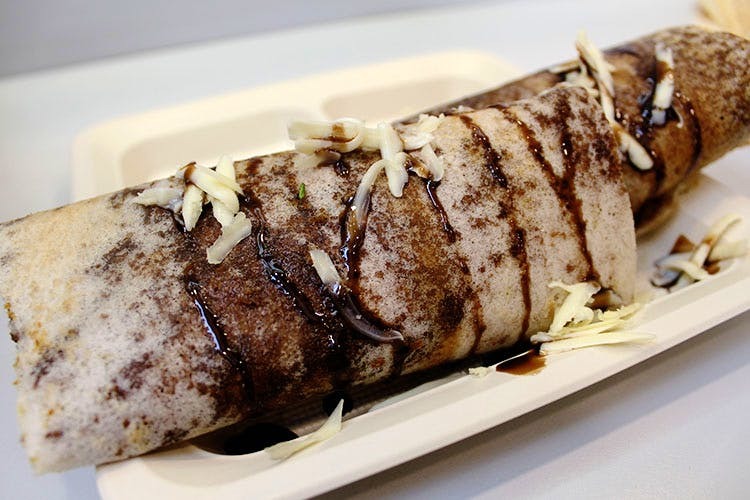 We tried the Schezwan Dozza, stuffed with Chinjabi goodness – this one is definitely an acquired taste. However, the Chilli Cheese Dozza is a crowd-pleaser. The Nutella Dozza also managed a solid 8 out of 10 for us; definitely pick this one if you have a sweet tooth. If you’re a dosa purist, there’s enough for you to pick from. Make Your Own Dozza and keep things simple with the Mysore Masala filling. These wacky ‘dozzas’ start at INR 130 and, since you can’t leave without dessert, expect a meal for two to be around INR 300. Skip the 6pm samosa and grab one of these instead.